One of the most desirable residential areas of Los Angeles, Beverly Hills is situated in the heart of L.A.’s Westside, between Westwood/Century City to the west, and West Hollywood to the east. The City of Beverly Hills is independently incorporated, and thus maintains its own police force, library, and municipal services. The population is currently around 35,000 and has one of the highest median incomes in the country, as well as some of the highest home prices. Property prices range from about $1 million all the way up to $25 million and more, and can vary greatly by neighborhood. The Beverly Hills Flats — the area between Wilshire Blvd north to the foothills — boasts some of L.A.’s grandest estates. Smaller homes are generally found between Wilshire and Olympic, as are many of Beverly Hills’ condominiums. Beverly Hills is a true “sidewalk community” with quiet tree-lined streets great for walking and biking. Nearby Roxbury Park is ideal for families, with huge open green spaces and sports courts, and plenty of space for games, picnics, jogging and more. 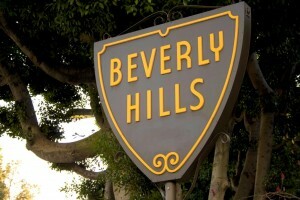 Beverly Hills is also a world-class destination for shopping and dining. 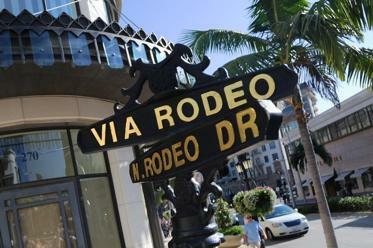 Famed Rodeo Drive, Beverly Drive, and Wilshire Boulevard are home to some of the most luxurious and trend-setting shops anywhere in the world. Gucci, Fendi, Chanel, Louis Vuitton and dozens more all have flagship stores in Beverly Hills, as do Neiman Marcus, Barneys, and Saks Fifth Avenue. Beverly Drive and Canon Drive both have scores of restaurants, from casual dining to some of the world’s most highly-regarded destination restaurants. Well-known spots like Spago, Il Pastaio, E Baldi and La Scala all boast outdoor / patio dining, as do many other local favorites. With so many world-class shopping and dining options, Beverly Hills caters to discerning residents and travelers as well. Locals and tourists alike frequent Beverly Hills’ landmark hotels, including the famed Beverly Hills Hotel, the Peninsula, the new Montage, and the Four Seasons Beverly Wilshire. All offer first-class accommodations, plus fantastic restaurants, lounges, gorgeous pools, and conference facilities. Below is a partial list of Beverly Hills homes for sale, which is updated daily. If you would like more information on any of these properties, please give me a call at (800)399-9659 x313 or you can leave your contact information on my contact form and I’ll get back to you within 24 hours.